Last time we left this book, it ended on a massive cliffhanger. Dwight, who's been playing both sides of the Negan/Rick war, shot Rick through the abdomen with an arrow. Negan ha all his men coat their weapons with walker flesh so any wound, no matter how small would be sure to kill the recipient. Now we crack this book open and see how Rick's group handles their wounded leader. We open up with Eugene and his escape group from Negan's camp all in a car. It's getting dark so they're going to have to find a camp soon, but one quick check of their surroundings with the car's headlights changes everything. They're surrounded by walkers, of course, and need to act quickly to get themselves out alive. Meanwhile, at Rick's end of the fight, it takes a couple pages for them to get Rick into a house, losing some of their men along the way. Just as they get Rick in the house, Michonne and Ezekiel set off a really cool trap to get rid of some of Negan's men. They hid in cars behind them and hit the headlights to give their own people a perfect sight of where Negan's men are. You all know what comes next, right? A lot of brakaka brakaka and a lot of dead bodies. Conveniently, Negan barely escapes. Eugene and his group have barely made it passed their group of walkers, distracting them with a car horn and quickly getting to the roof of a nearby building, its all they're got until the sun comes up and the dust clears. The next day is a day for clearing out all walkers around the camps, and for Rick's group, healing. It doesn't take long for someone in Rick's group to figure out that Negan's weapons have that walker residue on them and that spikes everyone's heart as they remember Rick was shot. Is he on his way out? You'll have to find out next time on Dead Talks!!! This issue was the definitions of filler. Absolutely nothing really happened in these pages, but I guess Kirkman needs to make up some money for a big Christmas. I don't know, either way, there's only two issues left in this 6 month arc. 2 issues left to see if Rick lives or dies. 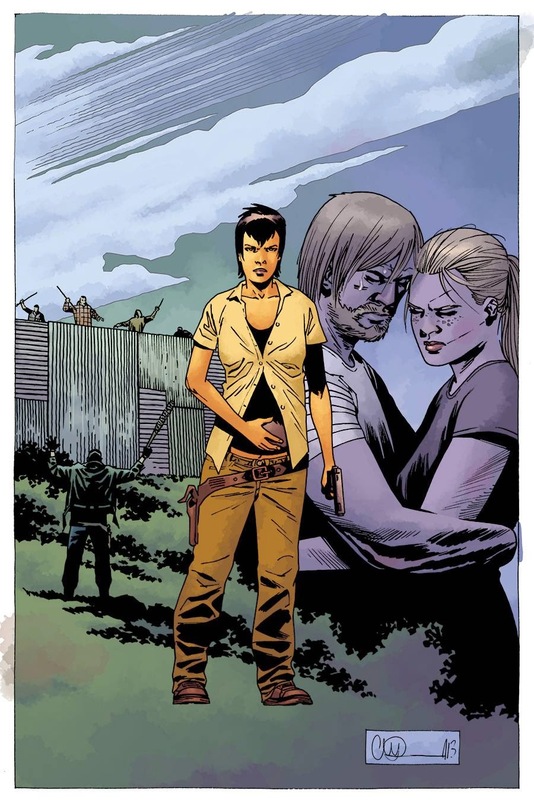 2 issues left to see what happens with Negan. 2 issues left before everything changes for everyone in the group one more time. Be back in a couple weeks and find out what happens next!